Democrat Mike Frerichs 'digital' problems now extend way beyond his owned social media channels. Word of his campaign problems/mistakes and it's impact on fellow campaigns has spread like wildfire and is now -apparently - firmly established as a *thing* of it's own. 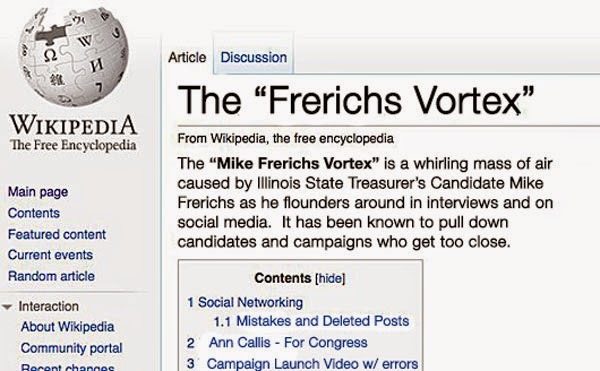 As evidence, check this out: Wikipedia now hosts an entry on the totally newly discovered phenomenon of the "Mike Frerichs Vortex". Check out this screen-grab of the entry. Don't get pulled down, folks. Stay as far away as you can.